Orleans Homes follow a tradition of delivering and building outstanding home solutions and added value of building. They are into operation since 1918. The company offers home solutions to meet the lifestyle of the clients. They even offer enormous options for customizing homes according to the preference of clients. They even take great stride to lay our focus to deliver your special amenities. The company takes modest initiative to offer highest satisfaction to clients in searching great neighborhood and affordable homes with an array of amenities. They also offer special service to calculate budget for buying homes and even offer a solution to mortgage facilities. There are currently 0 consumer reviews about Parker & Orleans Homebuilders available. Share your review. Please take a note that you are about to post a public review about Parker & Orleans Homebuilders corporate office on CorporateOffice.com. This review will be public, so please do not post any of your personal information on this website. 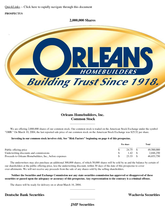 If you would like to contact the corporate offices of Parker & Orleans Homebuilders, please use their contact information such as their phone number, website, and address listed above to contact them. However, sometimes staff from Parker & Orleans Homebuilders headquarters do read the reviews on this website.